Austin is one of the cities in America that experiences widely varying temperatures. In the warm summer months, temperatures can rise to about 100+ degrees, while during the cold winter months, temperatures can dramatically drop. And about the only way for you to deal with Austin’s extreme temperatures is to install heating and air conditioning units. But there’s just one problem: air conditioners and heaters use an incredible amount of energy. Every year, heaters and air conditioners eat up most of our energy consumption by up to a staggering 70%. This is partially to blame due to the lack of technology over the decades when people relied solely upon fiberglass insulation in their attics. Well, those days are over! Thankfully, with our attic insulation solutions, you don’t have to feel sorry about touching that thermostat dial anymore the next time you need to regulate your home’s temperature. With Radiant Barrier Foil, you can easily reduce your energy bills dramatically without spending huge amounts of money for energy efficient materials and without you having to spend on home remodeling. It’s been a while since the Radiant Barrier technology was first introduced, but it wasn’t until recently that roofing contractors and property owners realized their potential and advantages. The City of Austin has seen the advantages of utilizing radiant barrier foil and now requires it for all new-builds in Austin. It’s effectiveness to conserve your home’s energy consumption is excellent. There are three ways by which heat is moved around the home’s interior – radiation, conduction and convection. Radiation is the transfer of heat across space whether something is in its way or not. It is actually responsible for most of the heat movement inside the home. A huge amount of heat that moves inside your home is actually heat that radiates from the sun. With conduction, heat is moved between two things – pretty much like how a spoon is heated up when it touches a hot food, or when glass gets cold when poured with cold water. A material that has less density has lesser conductive properties. Convection happens when heat is moved through the air. Think of how hot air moves up to the top of the room or how a turbo broiler or convection oven cooks food. You may be wondering why Radiant Barrier Foil, made from aluminum, is superior to regular insulation systems. But how exactly? Regular insulators don’t really stop the transfer of heat; it merely slows it down. Soon, the heat will move around the home, eventually reaching the attic and the areas below it, including the living spaces. 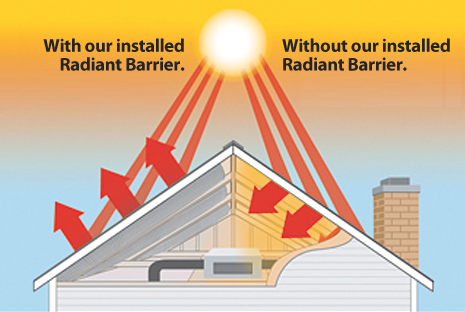 Radiant Barrier’s Foil, on the other hand, stops heat transfer by deflecting as much as 97% of the heat that gets in contact with the roof ALL the time! Radiant barrier foil, being made out of aluminum, has lesser density than an ordinary insulating material, thus effectively preventing the transfer of around the home’s interior. This leaves your home with a cooler living area and a cooler roofing system. Because of the cooler air that moves through your home, your air conditioning unit will not have to consume as much energy which translates to lower cooling and heating costs. For a more enjoyable summer, get radiant barrier foil installed in your Austin Home! 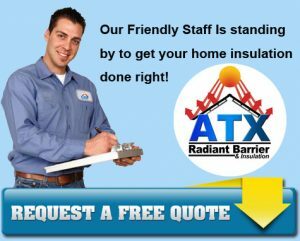 For more information on ATX Radiant Barrier & Insulation’s Attic Foil and other attic radiant barrier solutions, contact us today. We’ll show you how to make your home more energy efficient and more comfortable.